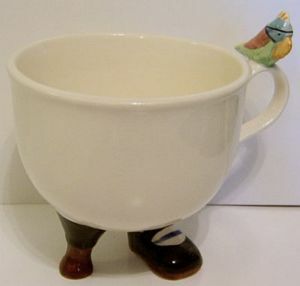 This is one of the amusing releases from Lustre Pottery - manufactured by Rising Hawk - in the 'Walking Ware' series. This one is an earthenware Long John Silver with Parrot Cup. It has a black shoe with a brown sole and a blue banded sock; the 'peg leg' is similarly black and brown but no sock. The multicoloured Parrot is attached to the handle of the cup. Generally, the few products which were manufactured by Rising Hawk had a paper sticker underfoot. Regrettably, this has now disappeared. The Cup is in excellent condition though it does have light crazing as is usual for these products. The overall height of the Cup is 3.25 inches (9 cms).